A fish, edible after being gutted and cooked. Obtainable by putting large bait in a fish trap. You can harvest human meat and catch fishes for fat for your first furnaces. 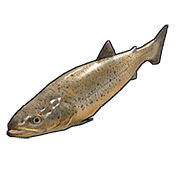 Unlike other types of meat, trout provides +15 hydration per bite, so you don't have to worry about stocking water.